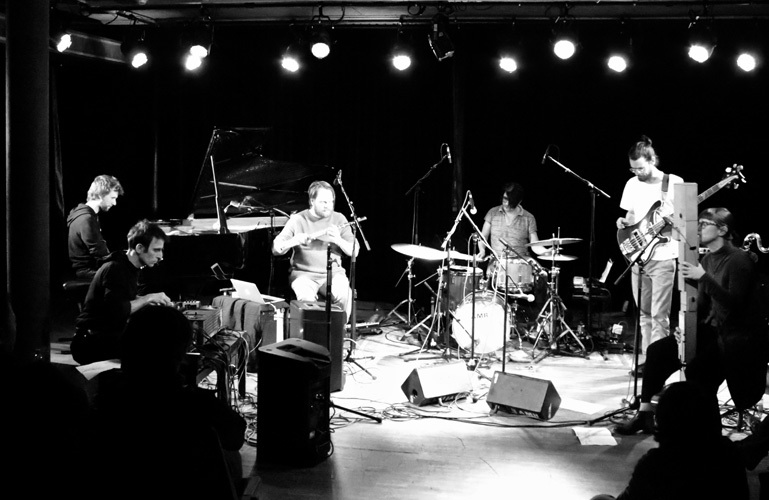 Gathered at Nicolas' initiative in March 2018 for a carte blanche at the AMR in Geneva, the N-Ensemble sextet uses all the geometries of the ensemble as compositional elements, but also as a springboard for improvisation. Using the large instrumentation as well as the skills of each of its members, the N-Ensemble navigates between "chamber" acoustic music and more electric soundscapes. Nicolas Field (CH, drums, electronics), Thomas Florin (CH, piano), Anne Gillot (CH, bass clarinet, Paetzold flute), Bjørnar Habbestad (Norway, flutes, electronics), Valerio Tricoli (I – Revox, electronics), Jasper Stadhouders (NL, electric & acoustic guitar , bass).